St. Ita was born in 480 to a noble family that belonged to a powerful clan. Her father, Kennfoelad, was a chieftain. Both Ita’s parents were Christians. From early childhood the girl showed a love for prayer and the holy life. Everybody around Ita noticed how pure and graceful she was. It was said that she possessed all six qualities of a virtuous Irish woman: wisdom, purity, beauty, musical talent, gentle speech and embroidery skills. When Ita was sixteen, she told her parents that she had a calling from God and had decided to be a nun. At first, Kennfoelad forbade her to take the veil: he had already arranged for his daughter to be married to a young nobleman. Ita turned to God for help. She prayed and fasted for several days. Then, Ita’s father received a divine message in his sleep. He learned that his child would become a great servant of the Lord and many people would find salvation through her. Not willing to resist any longer, Kennfoelad gave Ita permission to do as she wished. Ita and her sister Fiona took monastic vows and left home. St. Ita’s community at Killeedy took care of the elderly and poor. The nuns operated a dairy farm, and the products from it were used to feed the hungry. 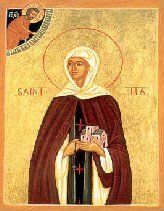 St. Ita herself led a severe ascetic life, eating and sleeping very little. She often abstained from food for many days. St. Ita had the gift of healing and working miracles. She cured a blind man and brought back to life her brother-in-law after he was killed in battle. Like many great saints, St. Ita predicted her own death and said farewell to her sister-nuns after she had blessed them. The Saint Wonderworker Ita reposed in the Lord on January 15, 570.